– The Randy Orton-Sheamus match was basically going off the “personal” edge that saw both men cost each other chances to become WWE World Heavyweight Champion. This wasn’t the smartest of choices for a match to open the show, as the crowd was mild, amusing themselves with “iOle!” chants. It was an okay match that never truly got into high gear, ending with a Brogue Kick that felt anticlimactic. WWE had to expect this from the rabid Brooklynites, who like everyone else, have been overexposed to this feud to care what happens. We do applaud Sheamus for at least standing on the announce table to get heat with a promo, but do we need another match from these two? – The four-team Tag Team Championship match between The New Day, The Lucha Dragons, Los Matadores and The Prime Time Players started with a New Day opening promo that insulted Brooklyn’s taste of hip-hop that was a pure riot. Their Kazoo parody of “Empire State Of Mind” was downright hilarious. New Day are starting to gain popularity because they’re actually getting to be themselves. As over as they were though, PTP was lucky to have Titus O’Neil, who had the crowd on their feet mimicking him after he demolished everyone upon the hot tag. The diving spots here were entertaining, with “bodies were laid out in the floor.” The finish here was actually clever with Kofi Kingston hopping on the apron and making a blind tag while O’Neil took out several members with one move, taking advantage of it. The over-the-top celebrating was totally worth the moment. – The Jon Stewart/Neville/Stephen Amell backstage segment was random conversation which was interrupted by Undertaker walking by when Stewart brought him up calling him all the time, making a joke. Thought maybe it’d be Stardust. Would’ve worked better in the moment. – The Rusev-Dolph Ziggler match was a culmination of a story involving scorned women, love, betrayal, dead fish, and “heroic returns.” Okay, dressing Lana up more to fit Ziggy’s style is a step up we suppose, but what on earth was that outfit? The match was great while it went on with Rusev’s aggressive style and Ziggler’s selling, until the end. The double countout finish was super-lame, but post-match tells us that this four-way feud will likely culminate in a mixed tag. Lucky us. – Dear Michael Cole, 10 years ago is NOT “a few years ago.” That said, the movie trailer-styled hype video for the Stardust/Barrett-Neville/Amell match was awesome. Why did they wait for the actual show to air it? This could’ve sold people alone if they saw it on Raw or something like that. As for the match itself, it was exactly what we thought it’d be – Neville did a lot of the work, but Amell also worked a few minutes, showing he was more than capable in the ring, adding a legitimate element to the match since he knew what he was doing. As we all expected, it ended with a Red Arrow on Barrett for the pinfall. Only complaint was that the main conflict was between Neville and Stardust, so why let Barrett take the pin? – The Intercontinental Championship match between Ryback, The Big Show and The Miz was better than we thought, but was still what we expected. No “classic” by any means, but the three had a fun chemistry of trying to steal each other’s pinfalls. Miz trying to go back and forth between pinning Show and Ryback until they kicked out at one was hilarious. Ryback winning was great, though it would’ve been better had he won with the Shellshocked, his own move, instead of picking up scraps from other opponents, though it fit in with the theme of the match. – The Stewart-Paul Heyman backstage interaction was… interesting? Though Stewart is usually well-liked by fans, his approach on this show was a strange one. 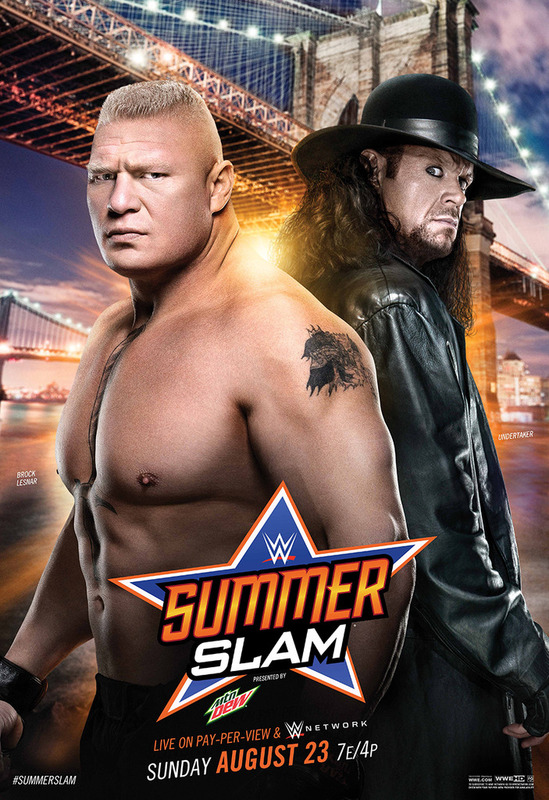 Lesnar has been looked at as the face of this feud with Taker, so it was awkward seeing Stewart advocate for Taker’s means of revenge by playing on the emotional impact of Lesnar’s ending of the streak and comparing it to “coal on Christmas morning.” That said, Heyman played it off perfectly by singing “Battle Hymn” again and wisecracking that WWE wasn’t able to get David Letterman and settled for Stewart. – The Bray Wyatt/Luke Harper-Roman Reigns/Dean Ambrose match started chaotically, with a brawl-like pace for the first few minutes. Reigns had a more negative reaction here from the Brooklynites, which served a surprise to no one. The middle of the match involved Wyatts dominating, later leading into Reigns picking up payback, to the dismay of the Brooklyn faithful. They liked Ambrose but booed Reigns throughout – probably not the reaction they expected. No signs of miscommunication on the face’s part, just a straight-up brawl. Felt kind of underwhelming thanks to the finish, though the match was entertaining. Nobody brawls like these four. – The WWE World Heavyweight Championship/United States Championship “Title For Title” match between John Cena and Seth Rollins was well-wrestled for sure, but obviously that was overshadowed with the confusing heel turn of Stewart to help Rollins both retain and win the U.S. championship. Not sure how to feel about that one. Sure, it’s something that will get people talking, but it’s kind of like a “Huh?” Moment rather than a “Wow, that’s awesome” moment. Beats the tired concept of “celebrity helps face beat heel,” but it would’ve made sense here since Rollins and Stewart had an “open” rivalry. Did he pay Stewart to interfere perhaps? – The Three-Team Divas Elimination Tag match between Team PCB, Team Bella and Team BAD definitely had one hell of a predecessor to one-up both from the previous match and the NXT Women’s Championship match the night before. Bella first eliminated Tamina and Team BAD after everyone took turns diving to the outside. The crowd wasn’t too hot for the same reason we always say is the biggest flaw with the Diva Revolution: it’s all action with no emotion behind it. How do we react to these teams? Do we like them? Do we hate them? The action was entertaining, but it didn’t steal the show or do anything close to what Banks and Bayley did the previous night. Lynch getting the pin on Brie Bella was telling, which makes us think that she’ll be the next to challenge for the Divas Title. Charlotte would be most believable to take the belt off of Nikki, so maybe this is their way of building up to that, yet still letting Nikki surpass the 295 day reign. – The Cesaro-Kevin Owens match was also thoroughly entertaining, while not reaching “classic” status, still a respectable effort from both men. Michael Cole mentioned several times about it being a “must-win” for Owens, which was an early hint of things. Cesaro hit his signature spots and was close to victory, looking great, but it was a better choice to give this to Owens, who needed the win more. Sometimes you just don’t think WWE will actually do the logical thing, but alas, they did. It seems as if all Cesaro’s losses are maybe building to something more. Guess we’ll see soon enough. – The Brock Lesnar-Undertaker match didn’t get the ultimate staredown moment, instead resorting straight to a brawl-like fight mixed in with false finishes on both ends, very entertaining main event… until the “controversial” ending that saw the timekeeper ring the bell without the Referee’s consent when Lesnar had Taker in the Kimura Lock, seeing Taker tap out. Referee Charles Robinson argued he didn’t call for the bell and Taker took advantage of the situation, despite tapping out before, deliberate hitting yet another low blow and applying the hell’s gate submission to choke Lesnar out. They opted for controversy in this instance. We didn’t get anything conclusive here, which might not have been the smartest idea to end the show on. Are we getting the set-up that leads to a rubber match? Why didn’t commentary bring up the low blow again? So much needless overbooking in this instance. Despite that, the match itself lived up to the hype, and it seemed everybody loved the moment where Taker mocked a laughing Lesnar. Let’s just hope the finish didn’t hurt things too much. Posted on August 24, 2015, in WWE and tagged Big E, Booker T, Bray Wyatt, Brock Lesnar, Byron Saxton, Cesrao, Corey Graves, Dean Ambrose, Dolph Ziggler, El Torito, JBL, Jerry Lawler, John Cena, Jon Stewart, Kevin Owens, King Barrett, Kofi Kingston, Lana, Los Matadores, Luke Harper, Michael Cole, Neville, Paul Heyman, Randy Orton, Renee Young, Roman Reigns, Rusev, Ryback, Seth Rollins, Sheamus, Stardust, Stephen Amell, Summer Rae, SummerSlam, Team BAD, Team Bella, Team PCB, The Big Show, The Lucha Dragons, The Miz, The Prime Time Players, The Undertaker, Xavier Woods. Bookmark the permalink. 11 Comments.